The Walnut Hill Volunteer Fire Department responded to a call on Mayhaw Road about 7:10 Sunday night. The residents of a two story brick home reported smelling something burning after turning on their heating system. After an investigation, firefighters were unable to find anything burning. The Molino and McDavid stations were also dispatched to the call but were canceled. Southern barbecue, bluegrass and gospel music, time with friends and a little history were all part of the annual Boxcar Barbecue in Century. The annual Alger-Sullivan Historical Society fund raiser was held Saturday in the town’s historic district. With church choirs, music from groups like the Sons of the Pines, and more, there was plenty of entertainment for everyone. 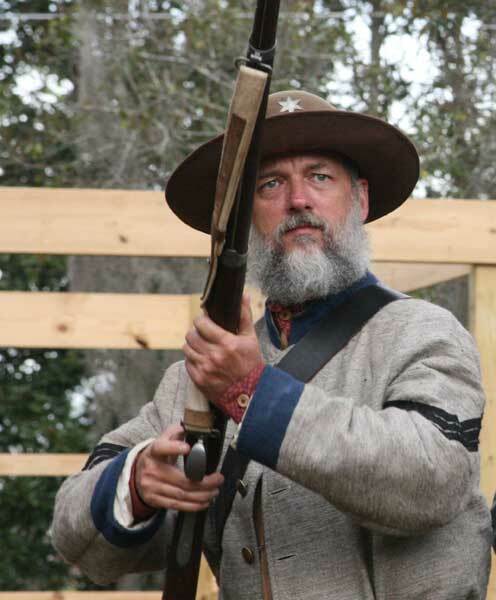 There was also a display of antique tools, pottery making, civil war reenactors, an attic sale, museum tours and more. And what would a Boxcar Barbecue be without…barbecue? Hot barbecue from Big Stevie’s Barbecue from Brewton, hot dogs and soft drinks were available. Visitors were also able check the progress on the restoration of Old 100, the historic steam locomotive at the ASHS’s railroad museum. The event is the Alger-Sullivan Historical Society’s last fund raiser of the year. Click here for a photo gallery from Century’s Boxcar Barbecue. 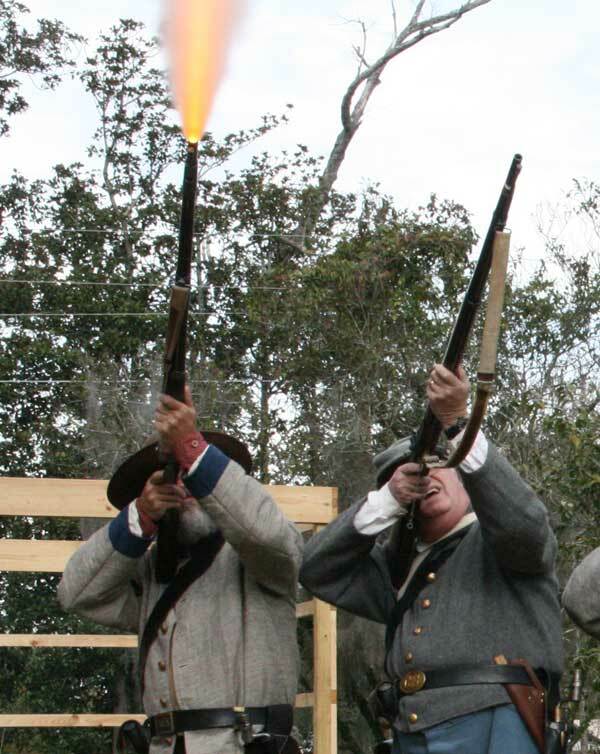 Pictured above: With fire shooting from the barrel, this picture captured the actual shot of an Civil War era gun Saturday at Century’s Boxcar Barbecue. Pictured inset above: A Civil War reenactor. 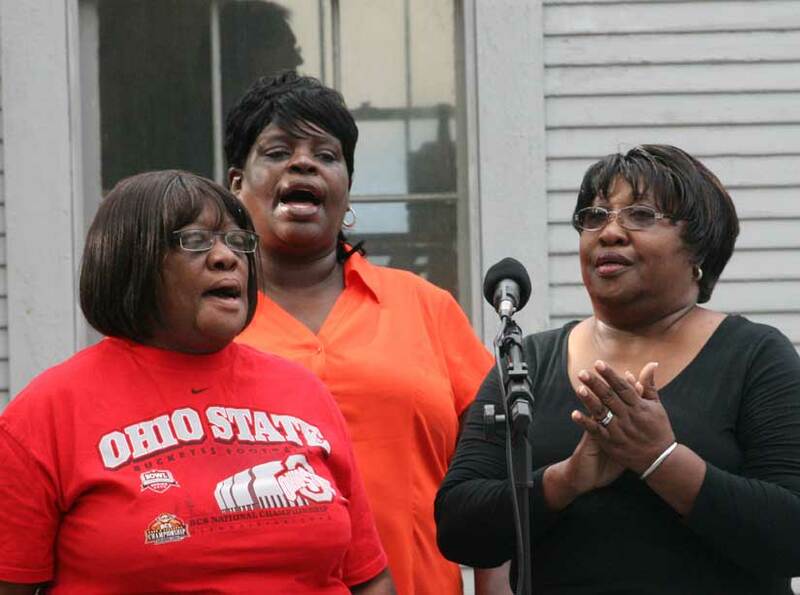 Pictured below: A gospel group performs. NorthEscambia.com photos, click to enlarge. It’s finally time to put away those bottles of water and those other hurricane preparedness items…the 2008 Atlantic hurricane season officially ends today. While it was a quiet hurricane season for us here in North Escambia, today actually marks the end of a record season that was one of the most active since 1944, according to the National Oceanic and Atmospheric Administration (NOAA). There were 16 named storms this year. Eight were hurricanes, five of them major at Category 3 or higher. Tropical Storm Fay was Florida’s biggest problem as it caused flooding across the state with a record four landfalls in August. It was also a record season because it was the first Atlantic season to have a major hurricane form in five consectutive months from July to November. For the first time ever, six consecutive storms (Dolly, Edouard, Fay, Gustav, Hanna and Ike) hit the United States. A record three hurricanes (Gustav, Ike and Paloma) hit Cuba. Now that hurricanes season is over, state officials say that it is time to — you guessed — start preparing for the next hurricane season. “Preparedness does not end with the hurricane season. Now is an excellent time to review, update your plans, take inventory of disaster supplies, and recycle goods and batteries,” said Florida Division of Emergency Management Director Craig Fugate. 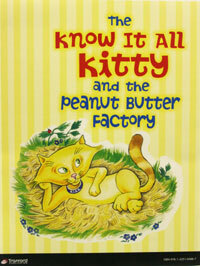 Children’s book author and storyteller Kathy Jernigan signed copies of her book The Know It All Kitty and the Peanut Butter Factory in Century Saturday. Jernigan is a storyteller and songwriter that grew up in Brewton and spent a lot of time with her grandparents O.P. and Eula Mae Renfroe. Her mom, Adelaide (Renfroe) Jernigan, was raised in Century. Jernigan, who now lives in Century, signed books at the Country Bumpkin and at the Alger-Sullivan Historical Society’s Boxcar Barbecue. She said the book promotes sharing, courage and fun. She wrote the story to entertain her nieces and nephews when they were two and three years old. In the book, the kitty really does know everything, it’s just the Know It All Kitty needs a lot of help along the way to live up to his name. He wants to share peanut butter goodies with his friends, so he musters his courage to do the one thing he hates to do… go underwater. He has to face his fears once again as he discovers a lake wizard in an underwater cave, and a hidden peanut butter factory. He sets off the alarm in the factory and it scares him silly, but he makes it out with a sack full of goodies for his friends. Autographed copies of the book are available for sale at the Country Bumpkin on North Century Boulevard. It is also available for order from Amazon.com and Trafford.com (click either site name for order information). 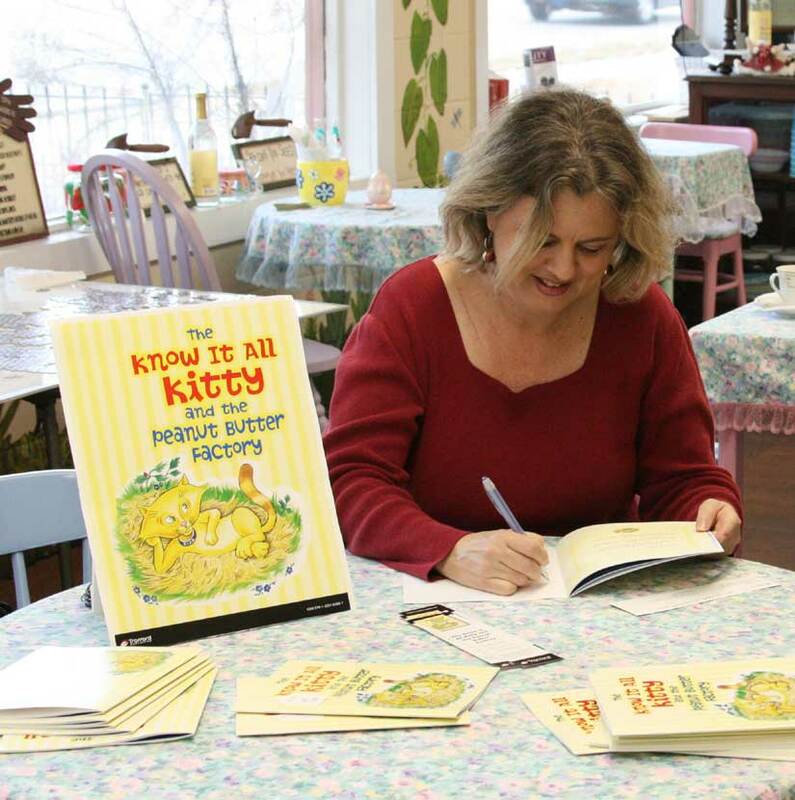 Pictured above: Author Kathy Jernigan of Atlanta signs copies of her book The Know It All Kitty and the Peanut Butter Factory at the Country Bumpkin in Century on Saturday. NorthEscambia.com photo, click to enlarge. The quarterly Fifth Sunday Singing will feature Crossroads this afternoon at Highland Baptist Church in Molino. 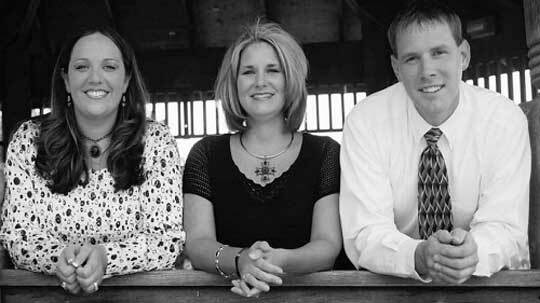 Crossroads is Kristen Sorrells, Lyndi Hardy and Brad Adkinson. They have been together just over a year, and they were quickly singing at churches across Santa Rosa County and a few churches in Alabama and Escambia County, Florida. They have performed at the 100th Anniversary of the Southern Baptist Association, Relay for Life in Mobile and at a recent company celebration at Solutia. Brad is a member of First Baptist Church in Milton. He and his wife Mindy have two children. Lyndi and her husband Robbie are members at Pine Terrace Baptist Church in Milton. Lyndi is also a teacher at Milton High School. Kristen and her husband Phillipp are members at Pine Terrace Baptist Church. They have three children, and she is a stay at home mom. The singing at Highland Baptist begins at 4:30 this afternoon and will followed by a covered dish meal. Highland is located on Highway 95A, just south of Molino Road. A former longtime North Escambia coach was recently inducted into the Atmore Area Hall of Fame. Better known as Coach Latham, Joe Latham dedicated his life to sports, making his mark in in his 27 years at Ernest Ward High School. He coached basketball, tennis, baseball and football. Coach Latham graduated from high school in Maplesville, Ala. in 1939. After serving in World War II, he graduated from the University of Southern Mississippi in 1948. He was picked up by the Los Angeles Rams, then went to Detroit as a single-wing fullback before beginning his coaching career. Coach Latham coached all sports but his favorites were football and baseball. He coached at Walnut Hill, Pass Christian, Miss. ; Franklinton, La. ; Orville, Ala.; and Wildwood, Fla. He dedicated 36 years of service to young people – 27 years at Walnut Hill. Coach Latham returned to Walnut Hill in 1960 after coaching in south Florida for two years. He received a number of honors during his career. He was named Coach of the Year for the Escambia River Conference in 1961, 1964, 1965, and 1971. 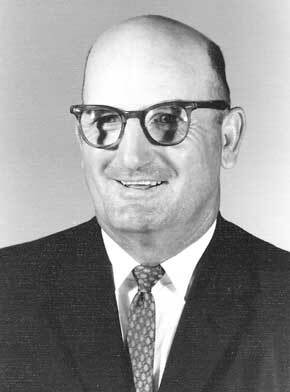 In 1965, Coach Latham was inducted into the University of Southern Mississippi Sports Hall of Fame, having played fullback there in the 1940s. He was assistant coach for the North All-Star Football Team in 1965. He was inducted into the Hall of Fame at his alma mater in Maplesville, Ala.
To honor Coach Latham for his dedication, the Ernest Ward High School stadium was named for him in the 1980’s. Article and photos courtesy Atmore News. Pictured top: Coach Joe Latham. 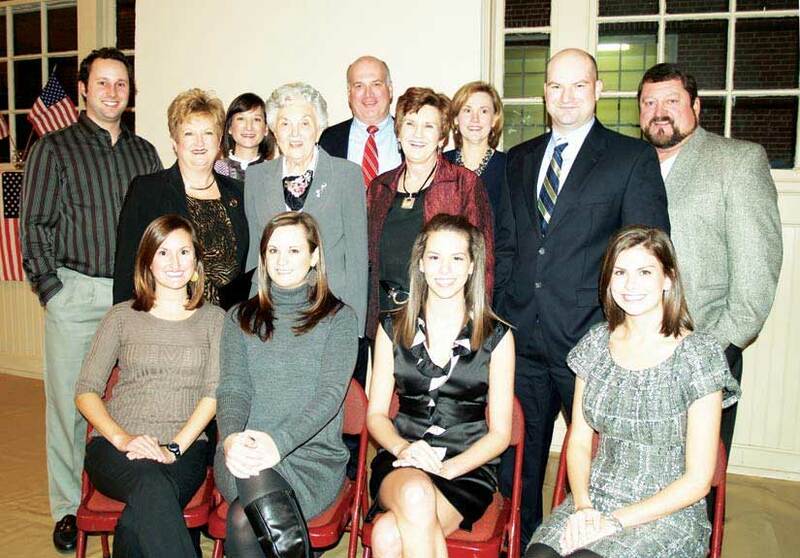 Pictured below: Members of the Latham family on hand for the Hall of Fame ceremony were (L-R front) Suzanne Rodgers, Kathryn Rodgers, Laura Latham, Mary Hunter Latham; (L-R middle) Cynthia Rodgers, Evelyn Latham, Carolyn Loggins, Jay Russell, Gary Loggins; (L-R back) Mark Rodgers, Leigh Ann Russell, Joe Latham Jr., Susan Latham. Submitted photos by Atmore News for NorthEscambia.com, click to enlarge. An Alabama fiber optic cable cut had Sprint cellular phone customers in North Escambia and South Alabama unable to make calls Friday evening. The fiber line belonging to CenturyTel was cut about 2:00 Friday afternoon; that fiber line is used to connect Sprint cellular towers together and carry calls to the telephone network. That created a “hit or miss” calling problem for Sprint cell phone customers from Mobile to Montgomery, including portions of North Escambia, sometimes unable to make calls. A Sprint spokesperson said that making a call or using other features such as the Internet or text messaging was difficult at times. With enough tries, a customers should have been able to get a call to go through. Tony Ellis from the Flomaton Hurricanes is one of the finalists for the Alabama Sports Writers Association’s 2008 Mr. Football title. The Canes senior running back is one of 42 finalists for the award. The finalists were picked from 146 players that were nominated by ASWA members or or coaches. Ellis is one of three back of the year finalists in Alabama 2A football. His high school career included at least 1,500 rushing yards per year for each of the last three years at Flomaton. 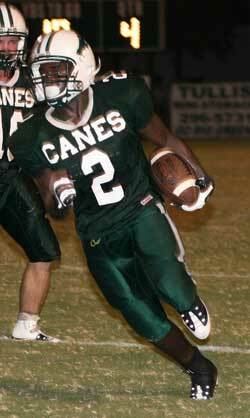 Ellis, who is 5-fo-9, had over 5,000 rushing yards in his high school career with the Canes. The Mr. Football award winner will be named in December. Photos courtesy Mike Newton Photography. If you are book shopping in Pensacola this weekend, you can make your purchase at one bookstore and help purchase underwear for homeless children at the same time. The Escambia County Coalition on the Homeless will receive a percentage of sales at Barnes and Nobles on Airport Boulevard. The funds are used to purchase new underwear for homeless children in Escambia and Santa Rosa counties. When you make your purchase, you should tell the cashier that you want your purchase to benefit the homeless children fund raiser. Last year, the ECOH spent $5,000 to meet children’s needs in the two counties. The ECOH says that hey have more children than ever with needs this year due to the number of families that are having problems with housing and other bills. A full 100 percent of all funds go benefit homeless children, including some here in North Escambia. Direct donations to the project can be made to: Homeless Children’s Underwear Fund, E.C.O.H., P. O Box 17222, Pensacola, FL 32522. 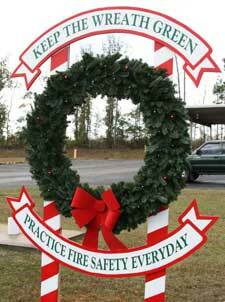 Escambia County Fire-Rescue and the City of Pensacola Fire Department are participating in “Keep the Wreath Green,” a holiday safety program designed to promote fire safety during the month of December. With this program, officials hope to reduce the number of fires during a time of serious fire danger with simple, life saving tips. This year, the fifth year of the campaign, five-foot wreaths will be on display at 22 different locations throughout the holiday season. These sites are the Old Escambia County Courthouse on Palafox Place, the Public Safety Building on W Street, all 18 primary county fire stations, and two fire stations within the City of Pensacola. Every time firefighters respond to a residential fire a green light bulb will be replaced with a red one to remind citizens of the dangers posed by holiday decorations. In North Escambia, wreaths will be displayed at the Century and Molino fire stations. To help citizens stay safe and “keep the wreath green,” officials are providing a holiday safety tip for each day of the month; visit www.keepthewreathgreen.com for a complete list. A kick-off event for the campaign will be held on Monday, December 1 at 6 p.m. with the lighting of the wreath at the Escambia County Governmental Complex, 221 Palafox Place. Escambia County Fire-Rescue and the City of Pensacola encourage everyone to follow the safety tips and have a happy holiday season. If you have additional questions regarding fire safety or the “Keep the Wreath Green” program, please contact Lt. Daniel Akerman at (850) 475-5530. Pictured above: The wreath at the Century fire station last December. NorthEscambia.com file photo.